Very Good. 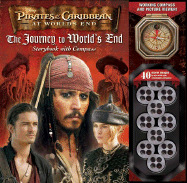 The Journey to World's End: Storybook with Compass [With Compass Viewfinder] (Pirates of the Caribbean: At World's End) by Hamilton, Tisha, 2007-05-01. Pirates of the Caribbean: At World's End (Hardcover). Intended for a juvenile audience.